You can see Sassy's litter of puppies here. 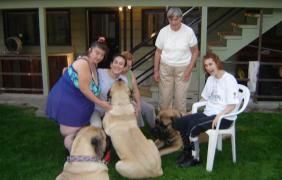 At the 2006 Mastiff National Specialty, with 79 Mastiff's entered, Sassy took 3rd place. (2nd best Female) She was awarded an Award of Merrit. At 6 months old she won over a 5 year old undefeated female champion. Sassy's best features are her head, movement and temperment. She is very well put together. will be bred sometime this year. Watch for details to follow. For mating, we found a stunning Matiff husband, with temperment being our #1 requirement. 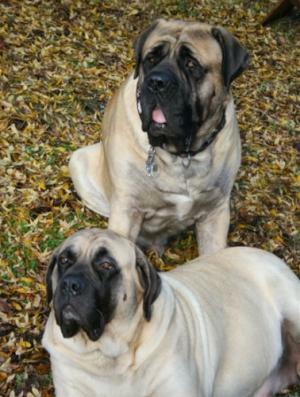 Sassy has been bred to Mountainview Mastiffs Walter for her last litter. Both Parents have had health testing, including, OFA for hips and elbows, Heart testing, and CERF certified eyes certified by Certified Canine Opthomologist. 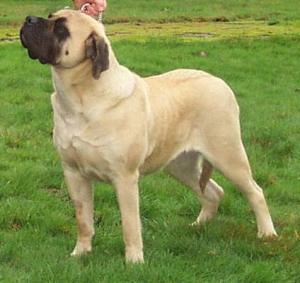 The Old English Mastiff is one of the heaviest breeds of dogs. Originally valued for their abilities as a guard and fighting dog, today's Mastiff is a gentle giant. It is a self-confident, watchful, and patient dog who is gentle-natured. Intelligent and dignified it rarely barks, but it is in its nature to defend its territory and family. Calm, steady and docile, this dog is normally excellent with children. 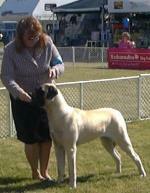 Good natured, but very large and heavy, they respond well to gentle, patient training. 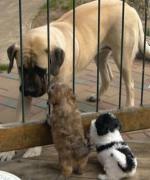 These dogs love to please and need lots of companionship. Walter weighs 257Lbs of huge bone conformation, massive head, stands 34in at the shoulder and wears a 36 inches collar. He loves to swim in the ocean and lakes and loves visiting those in need, as a real therapy dog. He will start the READ program this winter, helping kids with learning disabilities as well. 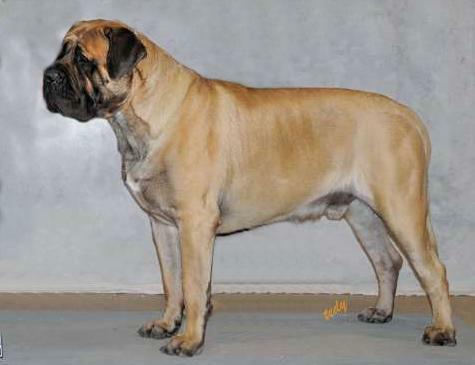 The AKC judge at the international show who gave him a G1 win said that on his whole career of 35 years, it was very rare to find such a massive Mastiff, with such top line and movement all put very well together. See Sassy's litter of puppies here.